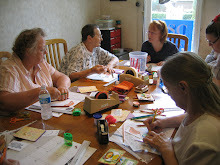 Participants will make a flipbook (finished size 2.75” x 11”) for a special friend. Numerous embellishments and stamped sayings will be utilized. Warning: This project will be hard to part with! Bag Lunch (12:00-1:00) is included. Participants will have the opportunity to create numerous embellishments using a variety of materials that may be utilized on cards or in scrapbooks. Various themes and projects. FUN!! Time: 3:45 - 6:15 p.m.